Home automation allows you to customize your home. The possibilities are almost endless. 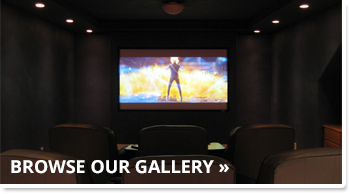 We offer everything from custom movie theater rooms, to updates and addons for existing systems. Surround yourself with the music you love. We can install and configure a seamless sound experience. Serving Stowe and Vermont since 1998 with over 48 years of technology experience! Vermont Electronics specializes in custom design and installation of Audio/Video, Home Theater, Smart Home Automation, Lighting Control and Security technologies into your home and office settings. Whether you're looking to technology for entertainment or piece of mind, we will customize the right solution for you. Remote and mobile access give you control of your home's heating, security and lighting while away. At home, indulge in the latest audio/video technology for entertainment and relaxation. Call us today and let's begin a new digital lifestyle together. For excellence in planning, installation, technical knowledge and customer service. © 2017 Vermont Electronics All rights reserved.